Panasonic says that the GH5S is a direct response to feedback they received from filmmakers about the very popular GH5. We got to check one out for ourselves during The Photography Show recently, and it does have some noticeable improvements. It has a new sensor, dual native ISO, the maximum framerate has gone up to 240fps, V-Log L gamma curve is included, and a host of other features. The Slanted Lens put the two cameras through a range of side-by-side tests to see how well the real world experience matches up with the on-paper specs. One of the key things noted about the camera, and one of the biggest issues with relatively small micro four thirds sensors is ISO performance. The GH5S features dual native ISO of 400 & 2500. This means that at ISO2500, you should see about the same level of noise as you would normally at ISO400. That’s over two stops better performance. In the real world tests, it seems the performance difference is closer to 1-1.5 stops. But that’s still a pretty significant increase. Despite both cameras being Micro Four Thirds, the sensor shape is slightly different. The GH5S sensor is slightly wider than the projection circle of the lens, allowing you to shoot in multiple aspect ratios. 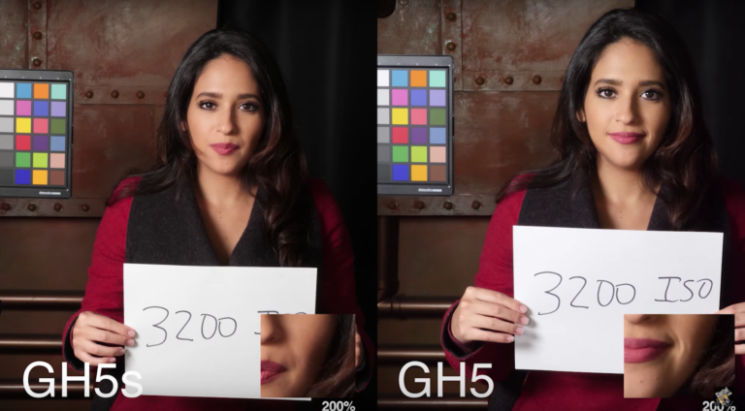 4:3, 3:2 and 16:9 allow you to utilise more of your lens’s field of view, and it’s noticeable in the video above vs the crop of the GH5 when you see the two side-by-side. One noticeable feature that’s lacking from the GH5S that is included in the GH5 is 5-axis in-body image stabilisation. For higher-end production, it’s likely not needed, as you’ll generally be on a tripod, slider, gimbal or another type of camera support system. The Panasonic GH5 is available to buy for $1,997.99. The Panasonic GH5S is slightly more expensive at $2,497.99. So, it’s a $500 difference ($400 once you take away the cost of adding V-Log to the GH5). So, it’s really up to you to decide whether the differences in feature set are worth the difference in cost. Generally, though, TSL advises that if you’re doing more run & gun or vlog style shooting, then you’ll probably want to get the GH5. But if you’re looking to do more cinematic stuff, want that better low light performance, included V-Log, 240fps, and less crop on your image, then go for the GH5S.